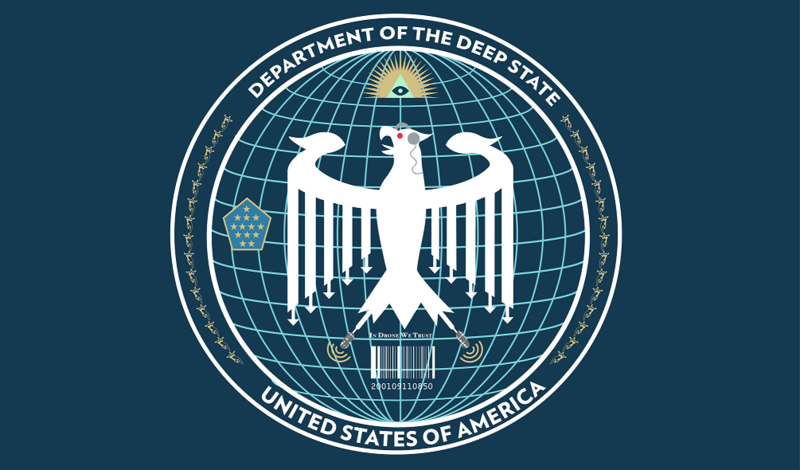 Hammer Drops On Deep State - Does Wikileaks Hold The Key To Bring Down The Whole House Of Cards? The latest revelations are not just concerning a former First Lady, Secretary of State and Democratic Party Presidential Nominee, But two Presidents, Bill Clinton and Barack Obama, the Former head of the FBI who is now leading an investigation into Trump for colluding with Russia in Robert Mueller, and the former Attorney General of the U.S. Eric Holder, and these are just the headliners. The allegations are about a $145 million quid pro quo with Russia, that went to the infamous Clinton Foundation in an extremely serious National Security breach, while Obama, his FBI, and his Justice Department looked the other way. This is a scandal of gargantuan proportions and would be moving forward at light speed, dominating all news, if the MSM didn't consist almost solely of left wing idealogues who hate what America stands for and are ALWAYS working in conjunctioin with the Deep State. Expect, as the noose is slightly tightening against these enemies of America, they will fight even harder as a matter of survival if nothing else. For example, today in the news even George Bush is now on board fighting Trump. Eight years during Obama, Bush never said a word. Today, he gave an Establishment speech being touted by the MSM. On October 16, 2017 ANP highlighted a message from Sean Hannity, "Tock Tock," to which those familiar with Hannity understands that is his way of giving his followers a heads up that something huge is about to drop and while the promised "Boom" actually came a day later than what he initially predicted, but when it did come, it was a virtual explosion which drops the hammer on the Obama administration, Hillary Clinton, the Clinton Foundation and multiple high level deep state players. 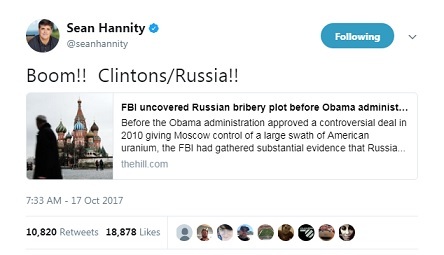 The article Hannity linked to at The Hill is titled "FBI uncovered Russian bribery plot before Obama administration approved controversial nuclear deal with Moscow." The article is long, in-depth, and is accompanied by document embeds, exposing hidden deals, corruption and provides ample evidence of real collusion with Russia, in regards to "a controversial deal in 2010 giving Moscow control of a large swath of American uranium." Enough so to have Congress already addressing the issue, just one day after the bombshell was dropped. The entire article is a must read, but we will offer some kepy quotes and points below before we start looking at a timeline of events that show this initial report, may just be the tip of the iceberg. They also obtained an eyewitness account — backed by documents — indicating Russian nuclear officials had routed millions of dollars to the U.S. designed to benefit former President Bill Clinton’s charitable foundation during the time Secretary of State Hillary Clinton served on a government body that provided a favorable decision to Moscow, sources told The Hill.Details laying it all out are provided in the original article, but I would like to highlight some key names exposed in the report, such as those that participated in the four-year investigation, occurring at time when the Obama administration made key decisions which benefited Russia, and who kept Congress and the American people in the dark. Read the article in its entirety at The Hill. In a follow up report by the same investigative writers, we learn that not only did the Obama administration not provide Congress with the information, but they actively threatened an FBI informant with jail time if he spoke to congress about what he knew. It may surprise some to learn that President Trump likes to Tweet, ok, so no, it isn't a surprise to anyone, but as evidenced back when he made claims that Trump Towers had their wires tapped by the Obama administration, just for the media to mock those claims until months later when it was revealed in reports that the Obama administration was surveilling Paul Manafort, who did conduct business in Trump tower and whose communications were being monitored there, President Trump often offers early clues to what is coming at a later date, and usually those assertions are validated once the truth is fully exposed. Flashback to March, via President Trump's Twitter feed, we see he basically told his followers exactly what was coming, stating "Why isn't the House Intelligence Committee looking into the Bill & Hillary deal that allowed big Uranium to go to Russia, Russian speech...."
The House may be slow on the uptake, but Senate Judiciary Committee Chairman Chuck Grassley, who had previously questioned "potential conflicts of interest between the State Department and the transacting parties," specifically in relation to Hillary Clinton who was Secretary of State at the time, and donations made to the Clinton Foundation, sent out letters to 10 federal agencies, dated October 12, 2017, titled "Uranium One Follow up," but did not release them to the public until Wednesday, October 18, 2017. In that letter, I raised additional concerns related to potential conflicts of interest between the State Department and the transacting parties. These concerns stemmed from the fact that during critical stages of the acquisition approval, interested parties, such as the Chairman of Uranium One, Ian Telfer, made large donations—some in the millions of dollars—to the Clinton Foundation while Hillary Clinton was Secretary of State. Those letters also directly reference the exact information revealed by The Hill article, along with a list of questions Grassley wants answers to, including a demand for specific Clinton communications. Please provide all records relating to communications with respect to Secretary Clinton and donations to the Clinton Foundation by parties interested in the Uranium One/Rosatom transaction. On October 8, 2017, Hannity tweeted "T Minus 7 and counting. Tick Tock.....," and exactly seven days later, Julian Assange tweeted out a mysterious code of numbers and letters, which ANP addressed on October 16, 2017. In a series of now deleted tweets, but are still available online via Archive is, Hannity also tweeted that same evening, "People need to READ AND LEARN. @JulianAssange HAS THE TRUTH. We deserve the TRUTH," and "Julian Assange-the ONE PERSON on earth that would know of alleged Trump/Russia Collusion. It’s time for Mueller & Justice Dept to GET INFO!." COULD THE EVIDENCE BE IN THE 33,000 DELETED CLINTON EMAILS? In the midst of those tweets, Hannity was offering his "tick tock" messages, indicating that Assange may hold the answer or to phrase it better, may hold the documented evidence of a quid pro quo between Hillary Clinton and the Russians, in regards to the Uranium One issue and the "donations" to the Clinton Foundation by interested parties of the Uranium One/Rosatom transactions. During the 2016 presidential election season, Julian Assange and the company he founded, Wikileaks, published tens of thousands of leaked emails from the DNC and from Hillary Clinton's campaign manager John Podesta, exposing how the DNC actively worked against Hillary's primary opponent while working in favor of Clinton campaign itself, as well as proof showing media collusion with the Clinton campaign. In June 2016 though, Assange offered a statement via an interview in which he asserted they had "enough evidence" to indict Clinton, also stating "there was enough information in the emails to indict Clinton, but that was unlikely to happen under the current Attorney General, Obama appointee Loretta Lynch." Granted the emails that were released were damaging, enough so that to this day Clinton is still attacking Wikileaks and blaming them, among dozens of other excuses, for her loss in the general election, but none of what was revealed in the DNC/Podesta emails was legally damaging to the point where it could lead to an indictment. The fact that nothing contained within the Wikileaks DNC/Podesta emails was enough to indict Clinton, suggests that Assange could still be holding on to whatever it was he thought was damaging enough to lead to an actual indictment, which has had many wondering if he and Wikileaks are in possession of those 33,000 emails that Clinton deleted after being ordered to turn over all work-related emails, claiming those deleted were "personal and private about matters that I believed were within the scope of my personal privacy, as Clinton stated in 2015. The problem with believing that statement is that the FBI later recovered approximately 17,000 emails that the Clinton campaign had not turned over and/or tried to delete, that were deemed work-related. There is good reason to believe that Wikileaks and Assange are in possession of those "deleted" emails, as internet mogul Kim Dotcom, "who has a long-standing relationship with Wikileaks and its founder," according to The Sun, said in November 2016 "There's unpublished material, yet to come out. 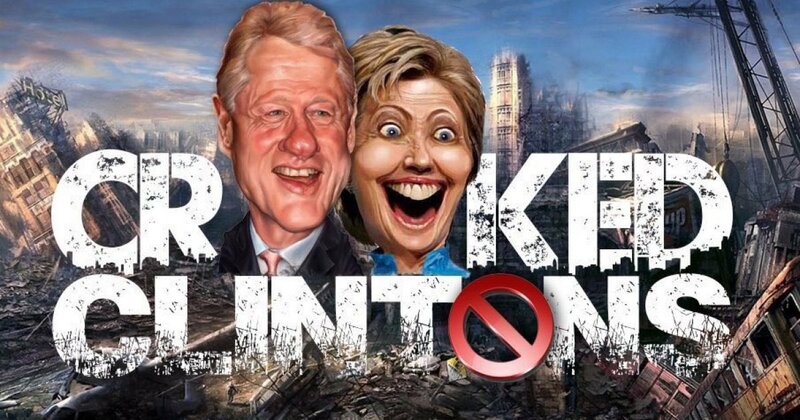 Clinton is in serious trouble," after having previously hinting that Wikileaks was in possession of those 33,000 missing emails. If Assange and Wikileaks are in possession of Clinton's missing 33,000 emails, in conjunction with The Hill's blockbuster report, they could hold the key to bringing down the whole house of cards, right on the heads of the Deep State, members of the Obama administration, including Hillary Clinton, Rosenstein, McCabe and Mueller, all in one fell swoop. IF Assange is holding on to those missing Clinton emails, it is time for him to put his money where his mouth is and release them all.